Lenovo's ThinkPad range is aimed directly at corporate users, with the R series designed for the entry-level market. The ThinkPad R61i (£635 inc. VAT) provides sturdy build quality, long battery life and intuitive usability. However, performance is low, suiting it more for basic office use than anything too demanding. As with all ThinkPad's, the plain black design provides a neutral look ideal for mass roll-out. The chassis is bulky, but quite durable. Its 2.9kg weight restricts mobility, but the 268-minute battery life is impressive and ideal for working on the move. Despite using an Intel Core 2 Duo processor, performance was relatively low. There's enough power for basic office tasks and for editing home videos or photos, but don't expect to multi-task with any degree of speed or to use the R61 for professional multimedia work. The large keyboard has a flawless typing action, ideal for long-term use. A tiny light above the screen illuminates the keys in dark conditions. Despite the large chassis, a tiny Pointing Stick is used to control onscreen actions. Some users will appreciate this, but it may deter others. The 15.4-inch TFT screen has no glossy coating. Reflections are eliminated, so maximum visibility is provided outdoors or under bright lights. The downside is that colour and contrast are also reduced, but image quality is fine for office use. A hotkey above the keyboard gives you instant access to Lenovo's proprietary ThinkVantage software tools, which provide easy access to complex system settings and maintenance tasks for even basic users. This uses the older Windows XP Professional operating system. Although not as fully featured as the more recent Windows Vista, it currently provides better stability and software compatibility, which professional users will appreciate. Storage options are quite weak, but will suit most uses. The 120GB hard drive lets you carry plenty of work files, music and photos. Data can also be backed up to recordable DVDs via the built-in DVD rewriter. Unfortunately, other features are limited. This is the only laptop in this group not to include a built-in camera above the screen. There is also no fingerprint scanner, which is unusual since most ThinkPad's carry this feature as standard. 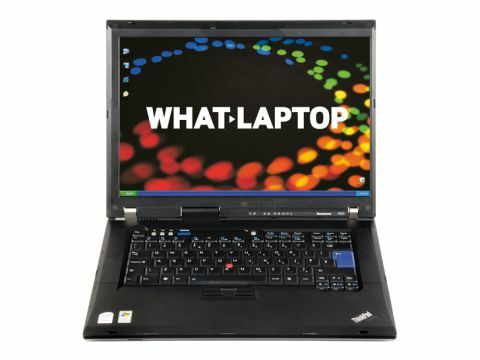 With varying strengths and weaknesses, the ThinkPad R61i is a tough sell. While battery life is impressive, the chassis is too large for frequent travel, and although usability is excellent, performance and features are limited.